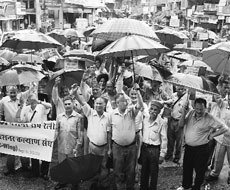 Pensioners hold protest march: Pensioners from the Himachal Road Transport Corporation (HRTC) on Saturday staged a protest march in the town asking the state government to sort out their pending demands. Addressing a gathering, the leaders claimed that they would meet the Chief Minister after the Mandi byelections were over and request him to fulfill their demands. Body found in Annandale area: The police on Friday found the decomposed body of an employee of the Himachal Cooperative Bank from the Annandale area. The police said Rajinder Singh was missing for the last 10 days and a report had been lodged. Hailing from Sirmaur district, he had been posted in Shimla. Youth drowned in Sutlej: Rakesh (23) of Patta village under Kallar gram panchayat was drowned in the Sutlej when his foot slipped and he fell into the water near his village on Wednesday. Reports said Rakesh and his mother Meera Devi were feeding flour to fish in the river according to a ritual, but the path had become slippery due to earlier rain. All efforts of villagers to pull him out proved futile. Rakesh's body could not be recovered. The police has registered a case. Man booked for suicide bid: The local police registered a case under Section 309, IPC, against Madan Lal of Pacca Tiyala under Kandwal police chowki on Wednesday evening for making an attempt to commit suicide. The police said the accused tried to hang himself with a plastic rope from a tree a few yards from his house. His brother Jeevan Kumar, who was returning home in the evening, noticed him and with the help of locals brought him down. Madan was unconscious and rushed to a private hospital at Pathankot where his condition is stated to be serious. 73 kg nag chhatri seized, 2 held: Nag chhatri weighing 73 kg was recovered from a vehicle when it was being smuggled near Brangal village in the district on Tuesday evening, a report said here on Thursday. Two persons have been arrested in this connection. The police has registered a case under relevant Sections of the Indian Forest Act and the Indian Penal Code. Traders honour SSP: Premnagar Traders' Association has honoured Dehradun Senior Superintendent of Police Kewal Khurana. Premnagar Traders' Association's president Jagdish Chawla said SSP Kewal Khurana had managed the traffic challenges of Dehradun city very well. He said Dehradun city had traffic problems for long and the SSP has taken many initiatives to solve the problem. Deepak Bhatia, Narendra Khatri and several other Premnagar traders were present on the occasion. Tea garden workers: Tea garden workers have accused the management of ignoring their concerns. Workers at various tea gardens on Sunday held a meeting in Dehradun. They decided to raise the concerns before the State Labour Department. President of Tea Garden Workers' Union MC Pant presided over the meeting.